This lovely picture of an Neolithic site was sent in by Sophie Mason who was on holiday in Cornwall. Sophie said: "It is a burial chamber by the side of a road (actually the road goes over the top of the “back” half of it!) near Lamorna on the south coast of Cornwall, right down at the westerly end. It’s part of a group of four monuments including the “Merry Maidens” stone circle. The chamber is very well preserved, including having been strengthened by the addition of a steel girder inside, most likely to ensure it isn’t damaged by traffic on the road above, but this is very tastefully done and you can’t see the girder unless you crawl right inside the mouth of the chamber." She added: "According to a helpful local bloke that we met, the stone at the entrance with multiple grooves on it is a concrete replica, the original being in a museum; it looked the same as all the other granite stones to me but then I’m no geologist. If it is a replica it certainly doesn’t spoil the experience. He thought the grooves might be axe sharpening marks. 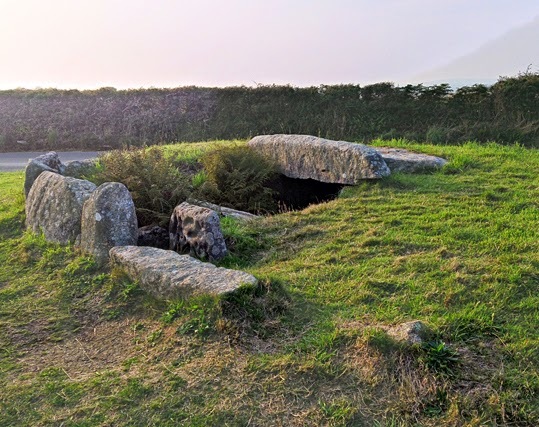 "Other useful info about this site: the bus from Penzance to Land’s End goes right over the top of it and there is even a bus stop right outside the entrance to the Merry Maidens’ field. And the South West Coast Path runs about two miles away." Thanks very much much Sophie for letting me post the photo on my blog.